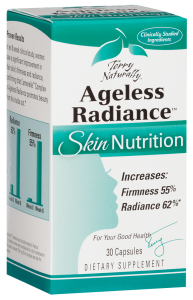 Ageless Radiance boasts a list of ingredients with a proven track record of helping your hair, skin and nails to shine, increase collagen production and more. I’ve used this daily for over two weeks along with drinking plenty of water, regularly exfoliating and washing my face and using an all-natural moisturizing oil and can say that so far, I do feel like my skin is less dry, brighter and I have not had any blemishes or issues. I am curious to continue using this product long-term to see if any fine lines begin to fade and see how others are prevented over the summer!